How do I know if my faucet or shower is leaking? 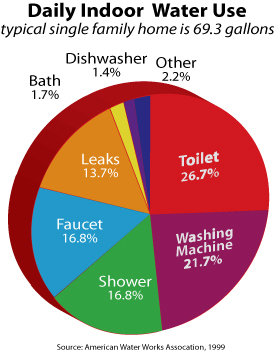 Approximately 16% of your usage comes through your faucet. Each faucet that drips 60 times a minute adds up to 1,225 gallons per year of wasted water. Faucet leaks can occur inside your home or at your outside spigot. How do I know if my outside tap is leaking? 748 gallons = 1 HCF. If your meter measures 2 HCF you used 1,496 gallons. PWD measures and bills your water in HCF (hundreds of cubic feet). How many gallons of water, or HCF, does a typical family use in a month? Your usage depends on the number of people in your household and your lifestyle. Refer to our rates for estimated usage by household size. What uses the most water in a single family home? Remember, your percent of use may vary due to your lifestyle. My water bill seems low. What could cause this? Number of days in thje reading period. If the number of days in your current read period is lower than the number of days in your prior read period, your current bill may be less. You can check the number of days in the Water Consumption Chart on your bill or in the MyOnlineBill section of our web site. Reduced water usage. You may have been on vacation or away from your home for an extended period of time . My water bill seems high. What could cause this? Number of days in the reading period. This is the most common reason for a high bill. If the number of days in your current read period is greater than the number of days in your prior read period, your current bill may be higher. You can check the number of days in the Water Consumption Chart on your bill or in the MyOnlineBill section of our web site. The days in your read period can fluctuate from month to month depending on the date we read your meter. Why did my usage increase by 1 HCF this month when I know I used the same amount of water for both months? Your water meter measures whole and fractions of HCF (hundreds of cubic feet), but PWD only bills the whole number; the fraction is ignored. For example, if your water meter measures 2.9 HCF, PWD bills 2 HCF when you actually used almost 3 HCF. The chart below illustrates why you are billed different amounts even though you used the same amount of water two months in a row. For ease of demonstration, assume the 3/1/09 read date was the date a brand new meter was installed. Why do I have a payment on my bill that I didn’t make? There may have been a payment application error. If this happens please contact us by calling 207-761-8310 or by email, so we can investigate. If you communicate by email, please do not enter your banking account number; email is not secure.